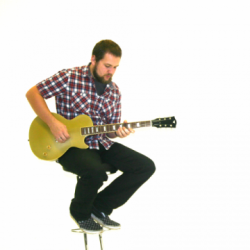 I am an electric guitar, ukulele and KS2 Music teacher living in Brackley, Northamptonshire. I am friendly and approachable, specializing in teaching beginner and intermediate abilities. I have a current CRB Enhanced Disclosure that can be viewed on request. I offer lessons at a teaching studio located near Fritwell, Bicester. I currently teach Guitar, Bass Guitar, Drums and Ukulele in 4 local Primary schools, 2 Secondary schools, a Rock and Pop Academy and also private lessons. On a weekly basis I teach between 80-85 lessons ranging from 15 minutes to 1 hour. I also teach KS2 Music in one of the Primary schools, 9 classes of 25-30 pupils per week. For beginners, I believe that learning the basics is the easy part, it’s the getting good that’s the difficult bit! But if you put in the practice and dedication you will be amazed how quickly you will see results. I am a firm believer in teaching people not only the physical aspects of playing the guitar, but also the knowledge required to recognise chord structures and song arrangements. I can also train you to develop valuable listening skills that will help you learn your favourite songs more easily and with better understanding. If you are already a competent player, I will be able to cover many aspects of theory and technique that will help you become a more proficient and well-rounded musician. From blues to flamenco and rock to classical, I have acquired a wealth of experience in different genres and will be able to help develop your knowledge of the theory behind these styles as well as solidify your playing technique. But the most important thing about learning the guitar is to know how to enjoy it. Music is something that we all interact with and when you start to test your playing ability, you will see how rewarding it can be. There is no better feeling than to master new songs and skills, and with the knowledge and techniques I can teach you, you will be well on your way to becoming the musician you want to be. ChrisFrom Martin (5/5): Absolutely fantastic. He has been superb! ChrisFrom John (4/5): Chris has been extremely supportive and encouraging so far - he plays beautifully which is very inspiring although I will never be able to get anywhere near his performanvce standard - I've been surprised how difficult it has been to transfer my musical skills which are essentialy vocal and - to a lesser extent - keyboard - to a stringed instrument. However I feel im making progress albeit slowly and Im enjoying the experience very much. I think Chris should not be reluctant to push me along as I quite able to take a fair amount of pressure - getting stuck into scales in the last week or so has enabled me to understand a little more about the essential structure of the ukelele and i would like to continue this formal element. I think Im still not doing very well in developing my strumming technique and need as much help as he can give me in this aspect of playing. If this message reaches Chris before my lesson tomorrow(11 00am) i would like him to know that Im intending to come despite the weather unless it deteriorates seriously by tomorrow morning… Im not sure that i have Chris's email or telephone number to keep him informed but I will now search though my documentation so see if i can find it. ChrisFrom Jenny (5/5): Chris is a great teacher. He is very warm and encouraging to my shy daughter. ChrisFrom Frances (5/5): Good communication, good timekeeping, good value for money, very pleased so far!